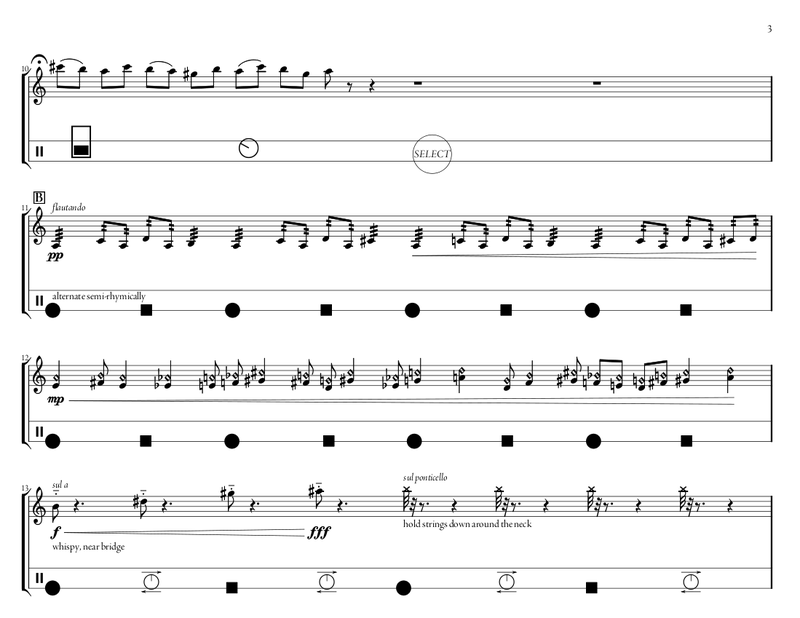 Untitled, for violin, circuit bent toy, and electronics, was an attempt to provide for audience participation in a concert hall setting. The idea was to provide an audience member with a simple, circuit bent electronic toy that he or she would then perform with a violinist on-stage. Engaging with the practice of circuit bending during a performance would hopefully encourage others to explore these techniques. Important to the score is the accompanying set of instructions, Simple Ways to Circuit Bend a Toy. The PDF below is the score itself, written originally in lilypond. If you would like the source code, as well as the special graphics I made to indicate the particular buttons to press and knobs to turn associated with the toy I used, please send me an e-mail.